Ready to Own your Own Business? This could be it! • commercial – FOR SALE CAD14,500 . New Price! 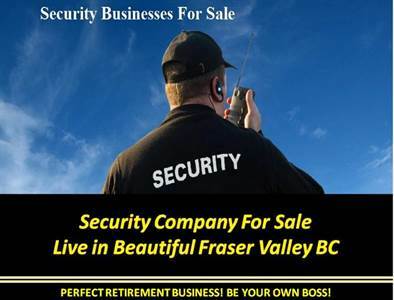 Over a decade in business, Located in the beautiful Fraser Valley, this small established security company has part-time accounts in place – commercial or private use. It’s ready for you to take it to the new level in the quickly expanding security industry. Make your investment now and generate income. You may have just retired from a career in Law Enforcement, (and you’re still full of energy) wondering to do now…THIS is it! Should have security license and some experience in this field. The demand for security is growing so call now. This could be a perfect fit for you. Comes with all security essentials for a smooth successful operation. Company liability, business licenses, registered corporation, registered name all in good order. Also has great potential for CCTV sales and install, alarm monitoring and mobile patrols. The sky is your limit! in Central Chilliwack, Chilliwack Announcing a price drop on 65 Confidential Street, a commercial. Now FOR SALE CAD14,500 . New Price! • 2682 sqft , 4 bath , 4 bdrm 2 storey “Relax, it's perfect, modern and spacious!” – FOR SALE CAD709,000 . New Price!! Beautiful Upscale Family home in newer neighbourhood on Promontory. Fabulous modern kitchen with high-end stainless-steel appliances, quartz countertops, double oven, walk-in pantry and ceiling high white cabinetry. Open family friendly great room. Enjoy wonderful built-in closet organizers through out. All bedrooms are large including spacious master suite with large walk-in closet, window seat, and luxurious ensuite. Lower level features a den (could be 5th bedroom), bedroom, family room and laundry room with high end laundry appliances. Air conditioned, climbing wall in garage, wired for surround sound and much more. Book and appointment to see this desirable home today! 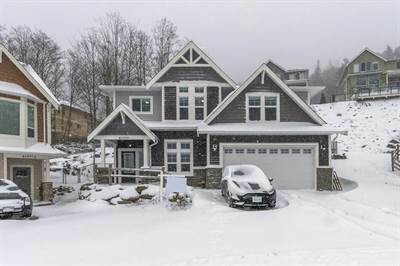 in Promontory, Chilliwack Announcing a price drop on 46999 Russell Rd, a 2682 sqft , 4 bath , 4 bdrm 2 storey “Relax, it's perfect, modern and spacious!”. Now FOR SALE CAD709,000 . New Price!! • commercial – FOR SALE CAD16,500 . New Price! in Central Chilliwack, Chilliwack Announcing a price drop on 65 Confidential Street, a commercial. Now FOR SALE CAD16,500 . New Price! • lot / land – FOR SALE CAD122,900 . Leisure Valley Recreational Lot in Gorgeous Cultus Lake area. A great lot with a concrete pad and 28′ canopy to house your trailer. Two sheds, one garden and one with a bathroom in it. Telephone and power 40 amp, at the lot and fenced with Frost Creek running behind.You own your land and pay a small yearly fee of $710, which include sewer, water, garbage and snow removal. Located just a few minutes from Cultus Lake, a short 1 hour trip from Vancouver, will bring you to a quiet recreational oasis, Playground for the kids, come look and make your offer today! A transfer of title for the non-real estate components must be made separately through ICBC. • 2682 sqft , 4 bath , 4 bdrm 2 storey “Relax, it's perfect, modern and spacious!” – FOR SALE CAD739,900 .